In this episode, we welcome prominent scholar and friend of the podcast Blair Davis of DePaul University to discuss a pulp hero from the radio era, Captain Midnight. Captain Midnight began as a radio serial in 1938 (which you can listen to here), at the dawn of the age of superheroes, and the character appeared in numerous other media during the 1940s and 1950s. Beginning as a famous aviator tasked to fight crime and nefarious elements, over the years he has been adapted to become more of a superhero, complete with secret lair and advanced technology giving him inhuman abilities. The character was revived by Dark Horse Comics in 2012, and the series recently ended its run after two years and 24 issues. 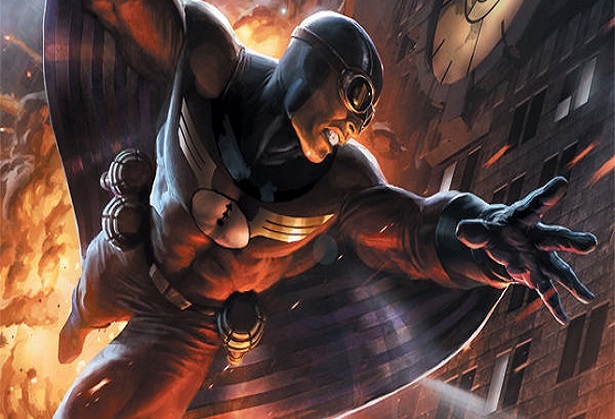 Captain Midnight as he appears in his most recent iteration, published by Dark Horse Comics. Because of the character’s longevity and appearance in numerous media, this episode focuses on the adaptation of the character across these media, and how such adaptation also suggests that Captain Midnight was one of the earlier examples of transmedia storytelling, which has become quite common in our contemporary world of shared universes (e.g. the Marvel Cinematic Universe). You can listen to the episode below, or you can download it by visiting our Podbean site. If you like what you hear, you should consider following The Pop Culture Lens Podcast on iTunes, Tumblr, Twitter, and Facebook so you never miss an episode. We’re always looking for ideas for new episodes, and for guests who can come on and chat about the media with us. Therefore, if you have any ideas for future topics and/or guests, or would even like to talk about some aspect of popular culture with us, please let us know! Anyway, we hope you enjoy this episode of The Pop Culture Lens, and, as always, thanks for reading (or listening, in this case).